Strategy games are all about control, placement, and smart use of your units, whether the units are soldiers or buildings. 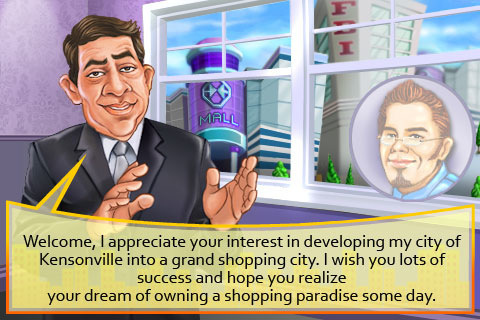 Shopping Mogul is a strip-mall simulator where you try to make a successful business layout. Don’t worry, it’s far more simple then it sounds. Released by Octane Technologies, Shopping Mogul is available on the iPhone, iPod touch, and iPad for $1.99. The graphics of Shopping Mogul are fine for what they are. This looks like a throwback to Sim City mixed with a generic Flash game story narration. User interface is nicely condensed and you even have an iPod button to listen to your own music, which is nice. The presentation is perfectly fine. The game explains the simple functions that you will be using like how to place a building, set up small units, and how the basic interface works, but where are the explanations for the ‘actual’ game? Ok, here is where I lose it. I have no idea what I’m doing here. Failing a stage is simply infuriating. Because of the slow pace of this style of gameplay and the fact that it’s a strategy game, there are just too many things I don’t know, and too many things I have no control over. What are those bars above the people’s heads? Why does it deplete? Is it the customer’s energy? Why are they happy when they empty this bar? Are you happy when you’re exhausted? Why won’t people visit more than one of the same shop? If you have 2 identical stores, the people just ignore the second one and you wasted a huge amount of money. Why do they allow you to even purchase two of the same shops if they don’t explain this to you first? The shops cost about 3 days worth of profit so wasting a purchase hurts. Speaking of expensive buildings, if you can only use 1 of each building, why are the buildings so ridiculously expensive? Upgrading always costs twice what the building was originally worth. So I basically have to buy the building 3 times to upgrade it? What does upgrading do? Why can’t I find this information out BEFORE I spend more money on it? Why doesn’t the Security & Care shop (the police/fire department) not actually stop the fires or arrest the burglars? What exactly do the chair, phone booth, or hotdog stand do? I don’t to make any money from them and it seems to increase the people’s bars. So does this mean it takes longer for them to be happier? Does this mean that if they are close to being happy, they will shop longer if they use these items? Too many questions and no answer whatsoever. I have run into lots of games where they don’t explain anything to the player, but this is still annoying and just because there exists games that doesn’t explain itself, it doesn’t make it ok. This is a strategy game. I should know exactly how much money the buildings will make for me, how much energy the customers have, how much energy my smaller units will give back to them, exactly what my upgrades will do for my store, and what the point of certain buildings are right from the start. It’s a strategy game because you must strategize, not blindly build stuff and hope for the best, fail, and then start over again just because you didn’t know better. I should also know from where the customers are entering the area and where they are leaving. Not giving me this information forces me to fail a level or quit out early and restarting just so I know where they are coming from. It’s not fair since customers are stupid and will walk past all the stores unsatisfied just because they aren’t allowed to walk off their predetermined paths. I want better explanations, the cash/goal/day information bar to stop hiding each time I tap the screen since I ALWAYS need that information, a faster ‘fast forward’ button function, and finally, the least important point in this review, I want to be able to change my character’s face. I don’t want to look like… spikey haired, glasses wearing goatee man… give me another option please. This is an infuriating app because I felt like each time I failed, it was because a huge lack of information. The trick to most strategy games is that when you fail in those games, you always feel like it was a mistake that you could have avoided. The reason you failed was because YOU made the mistake despite having all the information layed out for you. It’s not the game’s fault you didn’t gather enough resources or you didn’t properly defend a bridge, that’s the player’s own fault. The player should never feel completely cheated after each game. I cannot recommend Shopping Mogul, but that doesn’t mean that it’s necessarily a bad game. It just lacks all the information you need to make a strategy game. I understand why they didn’t tell you however since it’s trying to be simple, clean, and simple to understand. Too bad this is equivalent to changing a game of chess to 4 pawns and a king on a 4×8 chessboard. Well, ignoring my rage, I’ll give this a 3. It’s average only until they actually explain something. I’m hoping to see that because I do believe this could be an excellent mini-strategy game. AppSafari review of Shopping Mogul was written by Joseph Ho on January 7th, 2011 and categorized under App Store, Games, Strategy, Time Management. Page viewed 4741 times, 2 so far today. Need help on using these apps? Please read the Help Page. I need more information. 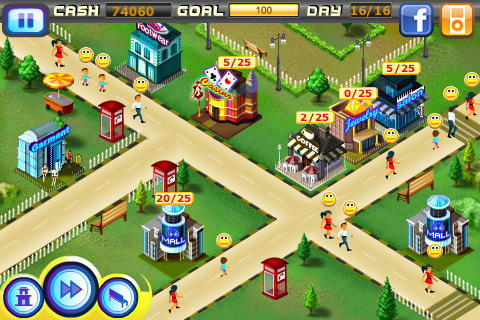 The game is fun but without more information it’s hard to master the game. I would not recommend this game until more information is given. I completely agree with this review. I have searched the web for help and there is nothing out there! Ugh!! !